The data on this page is now finalized. The complete version of reports with be available in the morning at around 10AM (UK Time). The table shows a comprehensive list of all bets advised by the tipster services used for ‘Project Profit’ on 25th October. This includes the actual profit or loss achieved by the Checkatipster team who followed all selections with a stake of £10/unit. This section shows screenshots of the email notification received as a subscriber of each monitored tipster service for ‘Project Profit’. This shows the time advisory was received and the quoted odds, recommended stake size etc. The odds and profit shown in the table above are the actual prices the Checkatipster team could obtain or get matched. 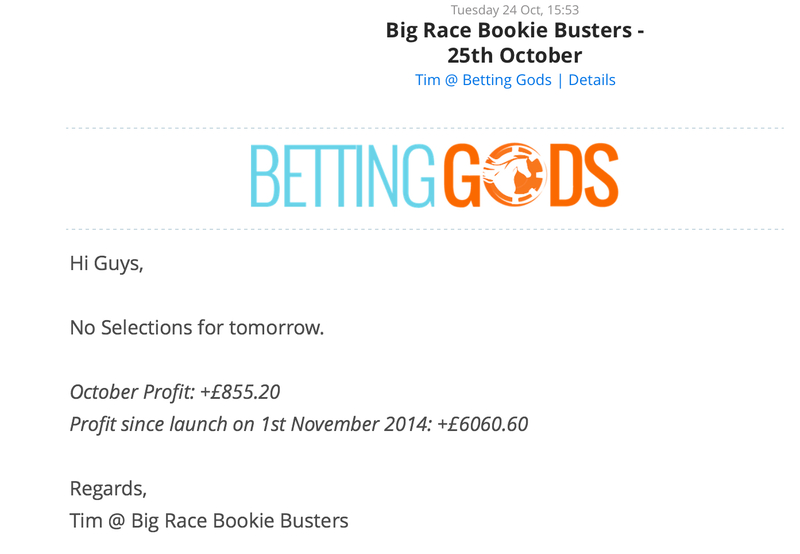 Subscriber Email Notification for Tipster Services – [Received Late Evening / Early Morning on 25th October 2017] Profit figures are those recorded from quoted odds. The table at the top of this page shows the actual profit the Checkatipster team achieved using a single bookmaker and exchange account. This will usually be slightly lower than that recorded by the official record.